Most of us think of mushrooms as a topping on salads and pizza, added to soups or chinese stir fry. In reality, mushrooms are a beneficial fungus called mycelium and at least 14,000 different mushroom species have been identified, and it is very likely ten-times (10x) more actually exist. Of these thousands of mushrooms on our planet, a mere 8 are considered beyond extraordinary in their powers to heal and rejuvenate both body and soul. These rare, medicinal mushrooms have the ability to generate extraordinary health within us, strengthening the body to combat disease and activating our longevity genes. This little-known world of fungi may turn out to be the reality to the Ponce de Leon's fabled Fountain of Youth! We Share 50% of DNA with Mushrooms! Mushrooms are considered functional food and non-toxic for daily use. When consumed regularly, they have the ability to restore the body to its natural state of balance. Mushrooms share 85% of human RNA and 50% of our DNA. When I heard that, I was astounded. I would never have thought we shared DNA with a mushroom! Mushrooms also make up a quarter of the Earth’s total biomass and 92% of all plants are dependent upon mushrooms for survival. Renowned researcher and mushroom scientist Paul Stamets, author of the groundbreaking book, Mycelium Running, a mini-encyclopedia on mushrooms, theorizes that mushrooms have the capacity to help save the world, not just for humans, but all life forms, including our rain forests and oceans. No wonder mushrooms have a remarkable ability to elevate health and well being in us. Mushroom extracts have been used for thousands of years throughout Asia to fight all disease conditions, particularly those associated with impaired or deficient immune system responses. Mushrooms have been shown to support cardiovascular and heart health, mental clarity and cognition, bacterial and viral infection, lowering inflammation, increasing energy, and especially boosting immunity. My fascination with medicinal mushrooms started way back in my journey of healing when I was studying at the Institute of Traditional Chinese Medicine in Shanghai, nearly 30 years ago now. It was here in the old library where 5000 years of knowledge was collected, studying and documenting Nature in Action, where old writings and manuscripts, mingled with current research papers, evidencing the power of mushrooms on all disease conditions. Big bell jars containing giant specimens of these mushrooms were displayed on shelves and used in lectures and presentations. It was here in the library that I found there are indeed thousands of species of mushrooms, and hundreds that are spectacular. But only eight, just eight, that are truly spectactular in their power. I'd like to introduce you to the Mushrooms that Roared with their incredible powers! For years I have wanted to make a medicinal mushroom formula with the capacity to change your life! 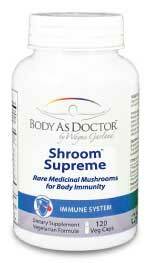 Shroom Supreme leverages the power of medicinal mushrooms for immediate - and long lasting - benefits for immune system health, mental cognition and longevity. Eight certified organic mushrooms are the core of this formula, each selected for its proven capability to stimulate our body's natural defense against colds, flu, infection and disease. Agaricus contains both alpha and beta glucan polysaccharides and is traditionally used to boost immune system response against a range of infections. In Japan, Agaricus Blazei is the most popular alternative cancer treatment method. The immunological properties of Agaricus have led to increased scientific interest and study for suppressed immune system response, high occurrence of infectious diseases (such as colds and flu), allergies or skin conditions, radiation exposure, slowing down the the aging process, diabetes and chronic fatigue and arteriosclerosis, as it appears to have an ability to help draw extra cholesterol from blood, thus preventing further plaque formation on the arterial walls. Chaga grows on the trunks of live trees and is a powerful immune system activator and antioxidant that is rich in immuno-modulating beta glucan polysaccharides and betulinic acid. Chaga’s complex mixture of these phytonutrients work by stimulating the body's ability to set up cellular defenses. These properties are particularly important for anyone with a yeast infection, as the compounds increase natural killer (NK) cell activity, invigorating the immune system to consume and eliminate the excessive bacteria and yeast. Cordyceps has been used since the 15th century in the high mountain regions of Tibet and Nepal. This unique fungi parasitizes larvae of ghost moths, growing a fruiting body that is revered for endurance and stamina and is well documented for enhancing athletic performance and recovery, giving it the nickname the Olympic Mushroom. Cordyceps also enhances the activity of natural killer (NK) cells, the front line soldiers of our immune system that seek out and devour abnormally growing cells. Cordyceps also shows support for managing blood sugar levels, protecting the heart and kidneys, and much more. Lion's Mane is named for its distinct resemblance to the mane of a lion, with plumes flowing from its head and stems as a signal of the power held within itself. Latest scientific research is showing Lion's Mane to be a powerful brain food and may help with reducing anxiety and depression while also supporting concentration. When taking consistently, Lion's Mane appears to aid in supporting cognitive function by stimulating nerve growth factor (NGF) production, a neuropeptide essential for neuron cells that process and transmit information. While more studies are needed, Lion's Mane is showing promise with dementia and Alzheimer's conditions. Maitake is an incredibly rich, juicy mushroom that may best be known for its cancer-fighting properties in Leukemia, as it helps the body make NK cells. Maitake contains grifolan, an important beta glucan polysaccharide shown to activate macrophages, a type of cell considered the heavy artillery of the immune system. Researchers have found Maitake has an ability to regulate blood pressure and blood lipids cholesterol, triglycerides and phospholipids, which are key risk factors in cardiovascular disease. Maitake has also shown it may be useful in reducing insulin resistance and moderating glucose, beneficial for managing diabetes, and may also be useful for weight loss. Reishi is one of the oldest mushrooms known for medicinal use, beneficial for so many functions from supporting circulation and blood pressure, activity against influenza, hepatitis and herpes viruses, autoimmune disorders, stabilizing blood sugar levels, improving oxygen utilization and lung function for bronchitis, allergies and congestion. Reishi is generally used as a adaptogen and tonic. It may also be useful for anxiety, bronchitis and insomnia. The ganoderic contained in Reishi may aid in allergies and auto-immune disorders. Other components of Reishi inhibit histamine release, improving oxygen utilization and lung function. Shiitake is high in B vitamins and vitamin D, the immune system’s super vitamin. Research shows that Shiitake mushrooms have anti-bacterial and anti-viral properties, and a protective effect against cardiovascular disease by supporting blood platelets clumping where immune cells binding to the lining of blood vessels. Additional health benefits include Shiitake's ability to aid weight loss, support cardiovascular health, fight cancer cells, improve energy levels and brain function, reduce inflammation, antimicrobial and support the immune system. Unlike many other medicinal mushrooms, Turkey Tail mushrooms grow abundantly all over the world, growing on dead trees, logs and stumps. Turkey Tail has long been known for its anti-bacterial and anti-oxidant properties, supporting the defense against infections and the common cold or flu. The Chinese have brewed Turkey Tail as a medicinal tea for centuries to support energy and immunity, as well as respiratory and gut health. The mycelium body contains prebiotics that assist the gut microbiome, aiding digestion and immune system response, as well as aiding leaky gut syndrome. In Japan, Turkey Tail has shown to be a powerful anti-cancer agent due to the special type of polysaccharides found within, and is often used to reduce side effects of standard anti-cancer therapy such as fatigue, loss of appetite, nausea, vomiting, and pain. We included Astragalus root, an herb revered for thousands of years for its adaptogenic properties, aiding the body respond to physical and emotional stress and disease. Astragalus' ability to increase immune cell function is well documented, supporting T-cells that seek out foreign antigens and destroy abnormal and virus-infected cells and boosting production of macrophages, special immune cells that gobble up damaged or infected cells. Astragalus has over 100 bioactive compounds including saponins, flavonoids and polysaccharides, special nutrients that support cardiovascular, lung, liver and kidney health, insulin production and blood sugar management, along with supporting the body's inflammatory response, acting as a free radical scavenger protecting against oxidative stress. In China, Astragalus is well known for its longevity benefits, and science is now discovering how Astragalus appears to strengthens the end caps of the DNA strands in each of our body’s cells called telomeres, supporting cell longevity and genetic integrity. Then, we blend the entire formulation with probiotics lactobacillus acidophilus and bifidobacterium longum, friendly bacteria to support gastrointestinal health and immune system receptor cells. The fundamental belief of all the ancient healing sciences from India and the Far East has been to make the body so strong that disease cannot occur. In China, they call this Health Beyond Disease, and is how the human body was intended to operate.